A discreet, compact and substantial package, the Black Box G1W-H is a powerhouse product that delivers above expectations, especially at the budget price point. The G1W-H is just one in a series of dash cams by Black Box, the point of differentiation being the ‘H’ in the name, which stands for ‘hidden’. With it’s sleek, black design, it boasts it’s stealth like appearance. 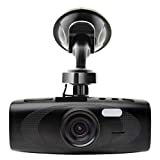 This dash cam has a combination of easy-to-use features and exceptional video quality and stands out as one that should be considered by all looking to purchase one. 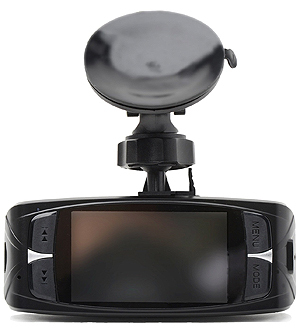 Besides the dash camera itself, the package includes an in-car charging cable, a swivel suction mount bracket, a USB cable and an HDMI cable. The mount bracket uses swivel ball technology, allowing it to be easily fastened to any flat surface and then rotated as desired. A micro-SD card does seem to be missing; however, this can be easily purchased from almost anywhere. The G1W-H can work with a micro-SD card with up to 32G of space, leading to about five to seven hours of continuous footage with no hiccups or interruptions. This is an acceptable amount for daily usage, so there is nothing to complain about in this department. The body of the G1W-H is minimal and smooth. The matte black casing is appealing to many and is less of an eye-sore than other competitors. As a camera, it is quite a bit lighter than others in the field, but that is only because of the cost-saving mechanisms introduced in the production process. Furthermore, it doesn’t take much to figure out where things are and what they do. The user-friendly interface clearly shows the Menu and Mode buttons besides the screen, along with toggles to fast forward or rewind. The screen is a 2.7” widescreen LCD, with excellent quality at 1080p and the ability to play back footage effortlessly. On the top, another set of tools are lined up – the USB port, headphones port and the on/off button. Clearly, just the first impression of the G1W-H shows there is a lot to offer design-wise. The lens, which utilizes wide dynamic range technology, is a 160 degree ultra-wide angle one with a 4x zoom ability. The video resolution turns out to be a high-definition 1920x1080P when recording at 30 frames per second and 1280×720 at 60 frames per second. With images, again the quality is superb. The photographic output provided is in a 5 mega-pixels JPEG. Additionally, because of the WDR, night-mode is up to standards as well. The enhanced LED light and LED night vision amalgamate to capture stunningly clear footage after the sun goes down. As you can tell, the major selling point of this camera is the quality of the videos and photos captured, especially in the price range it is offered. As for usage, the G1W-H does not possess overly fancy or unique characteristics. Instead, it is simple and to the point, providing all the essential attributes. Loop recording is available to record new footage over old footage, as well as a G-sensor, motion detection and an automatic on and off feature. Overall, it gives you exactly what you want with no-frills attached. The G1W-H is perfect for those who are looking to purchase an affordable, yet quality dash camera that is extremely undemanding in terms of usage and upkeep. It definitely falls under the category of ‘set and forget’ products, without ornamental features that may or may not be utilized. The Black Box G1W-H has been coined the best dash cam under $60, and with the features and benefits provided, almost seems to be a steal.